Many Americans believe that the Japanese food industry's distribution system is a deliberate barrier to foreign goods. It isn't -- it arises from the way the Japanese prefer to do business domestically. If anything, it offers significant benefits to exporters who take the time to learn its workings and plot their marketing strategies accordingly. Years ago, a product passed through several stages on its way to the consumer: the manufacturer sold to a Japanese importer, who sold to a wholesaler, who sold to a retailer, who sold to the consumer. Americans generally found this process cost-prohibitive. "Here, my product sold for U.S. $5.00," some would say. "In Japan, it'll cost U.S. $25.00!" The present system still necessitates markups along the way, but has been somewhat streamlined. Japan boasts the world's second largest retail market, with a value exceeding U.S. $1,124 billion (2007). The system is made up entirely of wholesalers and retailers -- about 335,000 of the former and 1,138,000 of the latter (2007). Japan's wholesalers have more influence than in any other country. All those wholesalers are needed to service the enormous number of retailers. Japan's present population is approximately 127 million. If you divide that figure by the number of retailers, it works out to about one retail store for every 112 people. In the U.S., a retail store services almost twice that number of consumers. The reason for the disparity is that in Japan, the stores are small -- very small. Retailers keep inventory levels low because of limited space. Most customers ride bicycles to the store and buy no more than can be comfortably carried. As a result, wholesalers have to make frequent small-lot deliveries. Here's where dealing through a wholesaler starts to look good. Wholesalers will buy high volume from you and handle intensive sales and delivery services to the retailers themselves. This saves you the unthinkable hassle of selling small quantities direct to a whole group of retailers and then figuring out how to replenish stock as needed. It also saves you money: small consolidated shipments cost a bundle in transportation and transaction costs, which will in turn push your product price well beyond the wholesaler's margin. Furthermore, a wholesaler reduces your risk by collecting the bill on your behalf -- a much more secure proposition than trying to collect payment from several different retailers yourself! Wholesalers usually deal with many manufacturers and importers. Therefore, a manufacturer or importer need only make a few direct shipments to its wholesalers to distribute its products, in contrast with the frequent direct shipments required by wholesalers in the U.S. Since distribution costs are dispersed among many manufacturers and importers, the burden on each is reduced. In the U.S., our wholesalers have to make many deliveries to hundreds of retailers all across the country. 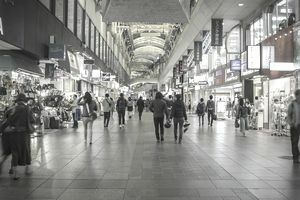 In Japan, the manufacturer or importer need only deal with a few wholesalers to get its products marketed and delivered to a vast number of retailers throughout Japan. Retailers also have an easier time of it, since they only have to place orders with one or two wholesalers. Better yet, each wholesaler will send a sales rep around two to three times a week to recommend products and take orders. For some products, the rep will even stop by every day! With the wholesaler to take over the tasks of intensive distribution and retail servicing, other divisions can stick to what they do best: the manufacturer can concentrate on putting out a quality product; the importer, on sourcing unique and competitively priced goods; and the retailer, on merchandising and consumer service. It's hard to monitor consumer tastes and demands from thousands of miles away. An appointment with a reputable wholesaler can get you entry into the market, credibility with the local players, and appropriate distribution of your product. A good wholesaler will not take on your product if it does not fit the needs of local consumers. Ultimately, only the consumer will tell you whether the wholesaler's instincts were sound -- but the wholesaler should be keeping close track of what's selling and what isn't, and adjust product offerings accordingly. The wholesaler plays a central role in Japan's dense, busy and efficient food distribution network. Since this network is already in place, take advantage of it -- choose a wholesaler, cultivate a close relationship and make them an integral part of your company's export strategy. They work for Japan's domestic producers, and they'll work for you too.